I stewed over how to quilt this top for a fairly long time. My gut said to do straight lines in opposite directions for the white background and the yellow arrows. 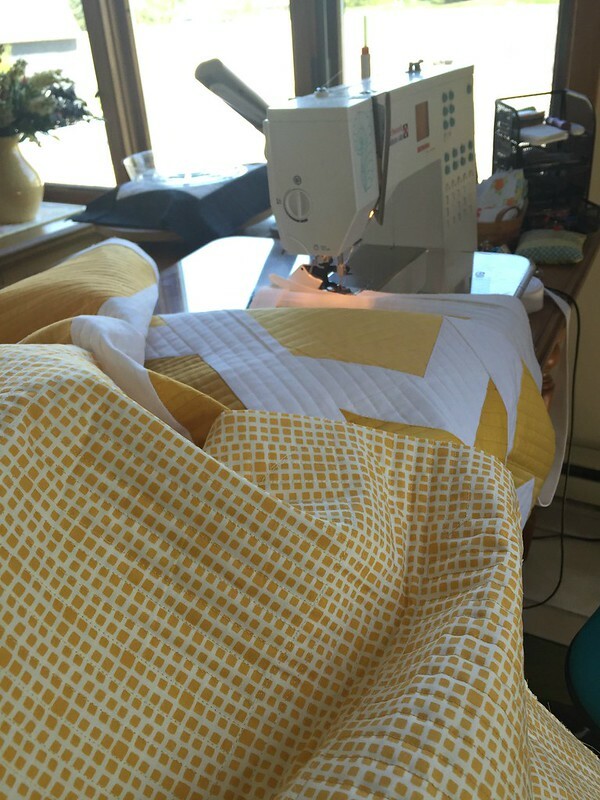 But I REALLY didn’t want to have to mess with all of those starts and stops while quilting the yellow arrows! In the end you can see I went with my gut 🙂 And although it took me what seemed like forever, it was so very worth it in the end. I used my favorite Aurifil thread in white and a couple of shades of yellow that blended perfectly with the ombres. The below is a photo from right after I finished quilting and took it off of the longarm. I think you can still see some of the threads I needed to bury. I’ve now learned the hard way that it’s best to bury the threads as I go because whenever I thought I was done burying them, I’d hold the quilt up again and find more! Here’s a photo I shared on Instagram in April as I was adding the binding. 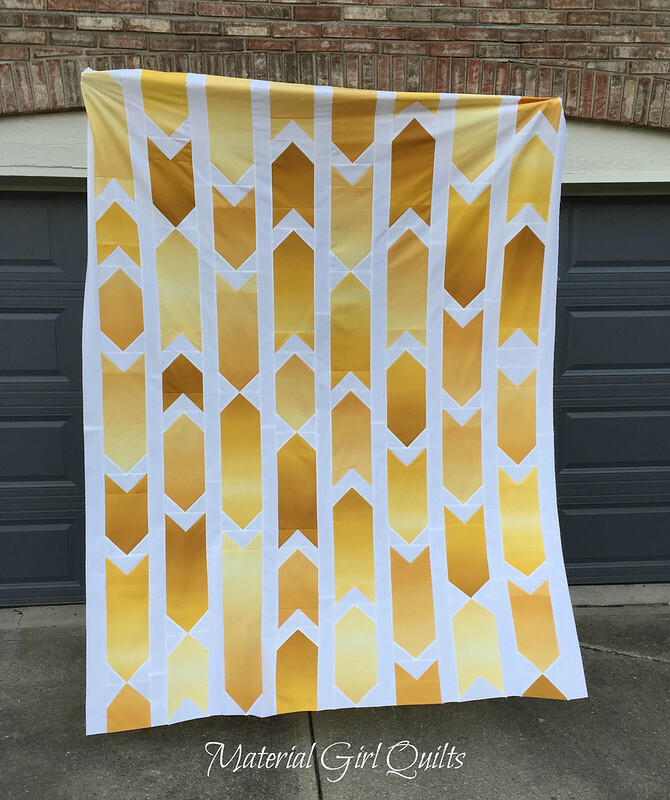 I used an Art Gallery Squared Elements print in yellow for the back that I had in my stash…perfect! And here is a photo when I finished hand sewing the binding down. As usual, it was late, dark and had to be shipped out the next day…so the lighting isn’t the best, but you can see the entire quilt. Straight & Arrow is featured in Love Patchwork & Quilting’s Issue 38 which hits UK newsstands today (and US retailers in about 4-5 weeks). Again, they make my quilts look SO GOOD!! I can’t wait to buy the magazine when it hits the state’s!!! I love your quilt. 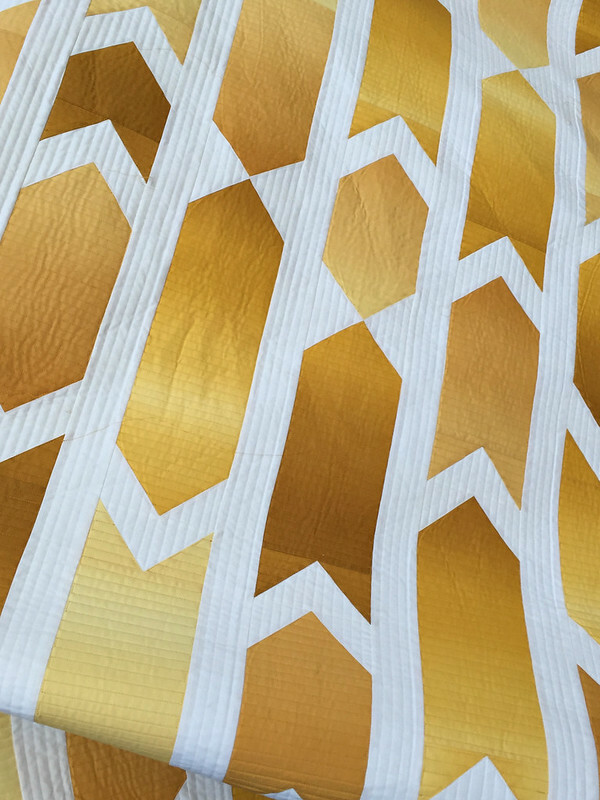 I was at my quilters guild board meeting last night and some of us were talking about yellow fabric. I have always liked Ombre fabric so I was so happy when here this morning I am seeing your beautiful quilt!! Enjoy reading your blog posts. You have such awesome ideas!!! i help out at our county fair in the quilts division and the judge this year kept commenting on doing a better job of showing off the design of the quilt with the quilting – she would have loved yours!! Lots of work, but your “gut” was right – the quilting is just right. Lovely quilt. The quilting looks absolutely perfect for that quilt! I need to see if my digital version of that is available. It’s like a beautiful sunset! I saw this in the magazine and it is absolutely gorgeous 🙂 The quilting lines you chose really enhance the ombre effect of the fabric – it is interesting to hear your process for deciding what to do. 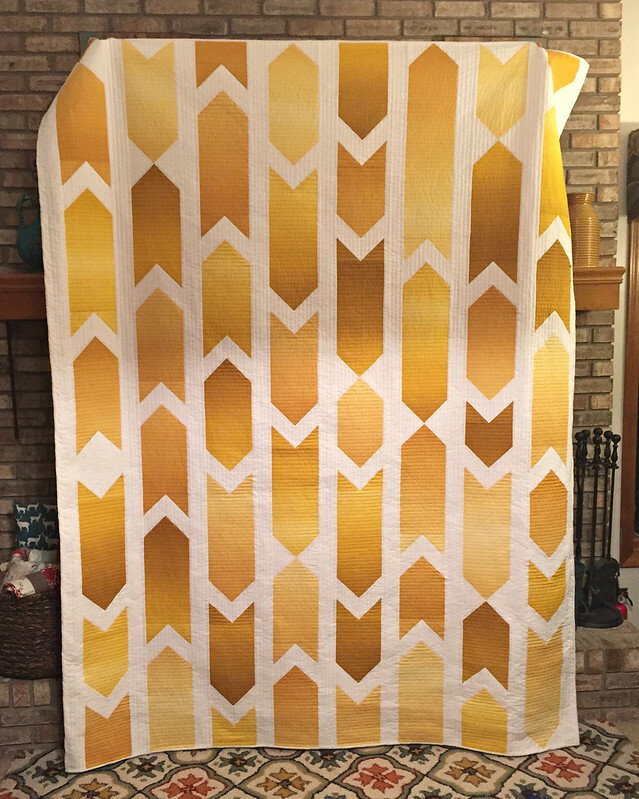 I love everything about this quilt, the fabric is really striking! And I know how it feels to have hundreds of threads to bury, but as you said: so worth it! Can’t wait for the magazine to arrive in my letter box!